Bilbo Baggins in the main protagonist and the titular character of The Hobbit. Bilbo is hired by Kind Thorin Oakenshield, his 12 Dwarven followers and the Wizard Gandalf for their quest to reclaim the Lonely Mountain for the dragon Smaug. Upon accepting, the group "Thorin and Company" was created. Along the way to the mountain, Bilbo and his friends came across trolls in the wilderness and turned them into stone. Bilbo stole an Elvish dagger from the trolls and named it "Sting." From here they traveled to the elvish haven of Rivendell and across the Misty Mountains. 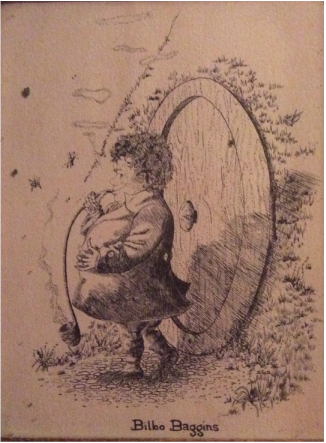 While in the Misty Mountains, Bilbo unknowingly found the One Ring. The group then traveled through the black forest of Mirkwood and to Esgaroth before finally making it to the mountain. After making their way to the mountain and finding the secret entrance, Bilbo goes into Smaug's lair alone to steal some of his treasure. Smaug sense Bilbo enters and attempts to question Bilbo into divulging his true identity. However, Bilbo only answers Smaug with riddles. Escaping Smaug's lair with a stolen cup, Bilbo sends Smaug into a frenzied rage. This rage results in an attack on the Laketown (Esgaroth). Bilbo tells Bard of Smaug's soft spot on his underbelly which allows Bard to kill Smaug. After the defeat of the dragon and the completion of the Battle of the Five Armies, Bilbo makes his way back to Hobbiton only to find his family selling his possessions as they believe he was dead. Using the 2 chests of treasure he had taken from his quest Bilbo buys back all of his belongings and returns to his old life in Bag End.